I have lived with art since early childhood growing up in North Carolina. My mother, a commercial artist and writer, my grandmother a weaver gave me clay and paints at the kitchen table to "stay out of the way" in our busy household. Hand crafts, music, camping, and natural science all played a big part in my childhood. I tramped the mountains and wandered the seashore often. After spending a year at UNC in Chapel Hill studying science, I ran off to art school. It was the 70's after all. The arts, poetry, freedom of expression and alternative life styles were more appealing. I attended art school at NC School of the Arts in Winston Salem, Ringling School of Arts in Sarasota, and The New School of Art in Toronto. Summers were spent teaching arts and crafts at SeaCamp in Big Pine Key, Florida. I moved back to Big Pine in 1978 to live on a houseboat with my husband doing odd painting jobs to make a living. In 1979 I opened up a small screen printing business "Red Heron Handprints." For over 30 years I have worked creating t shirts for business and nature designs on textiles sold at the local market. While raising a family I volunteered often to teach crafts and outdoor skills to schools kids and scouts. Other passions include gardening, butterflies, bonsai, diving and camping, my family and my dogs. 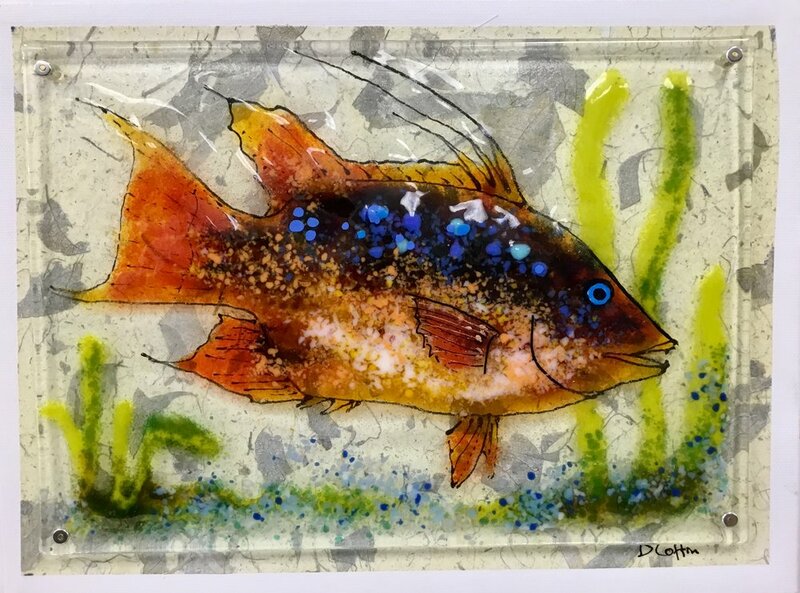 Currently I am working with fused glass "frit" painting. A technique of painting using crushed glass to shape images which are then fused together. 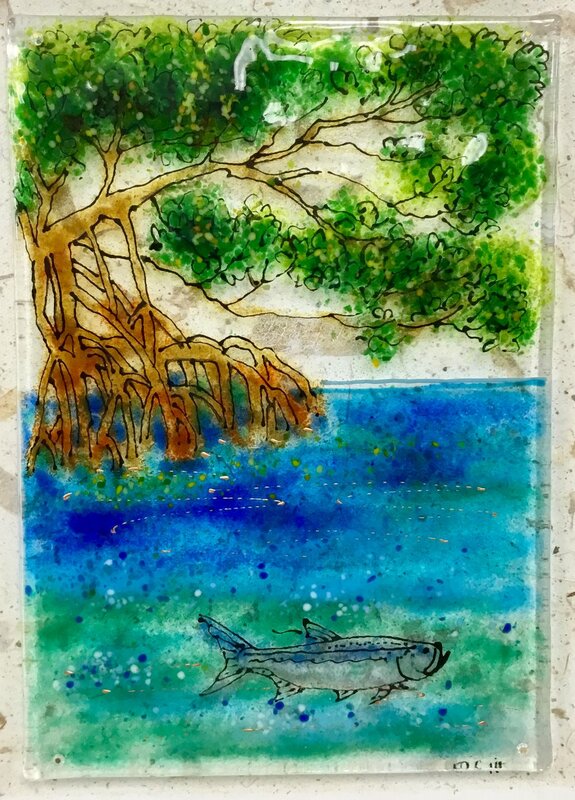 The sparkle of glass and local beauty of life everywhere in the keys keep my inspired. I am a working member of Artist in Paradise and Lower Keys Artist Network. You can see my work at the gallery or visit my garage studio at 31313 Ave. A. on Big Pine. I also show at local craft fairs all season and am a year round resident of Big Pine. I accept commissions for custom work.